It features a solid brass precision machined barrel mounted on solid cast brass carriage with polished highlights. The breech closure, trunnion and barrel are hand polished to a high luster. Includes a mahogany presentation base. 100% made and assembled in U.S.A. 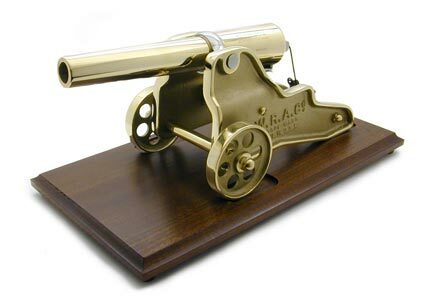 The Presentation Brass Winchester Cannon is available factory direct from the Bellmore Johnson Company. For pricing, availability and ordering please visit The Cannon Store or telephone, toll free: (800) 575-2171.